Ah King’s Shipyard – location 1925 to 1955? 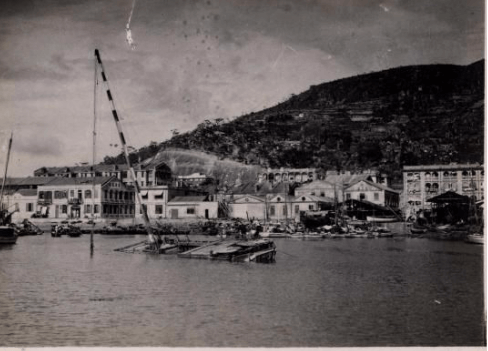 Stephen Davies has been investigating the location of the A King Shipyard in the Causeway Bay Typhoon shelter – 1925 to 1955. Also known as Ah King’s. 3rd 1955 – 2002 Moved to the final location when the Causeway Bay typhoon shelter was reclaimed to make Victoria Park. 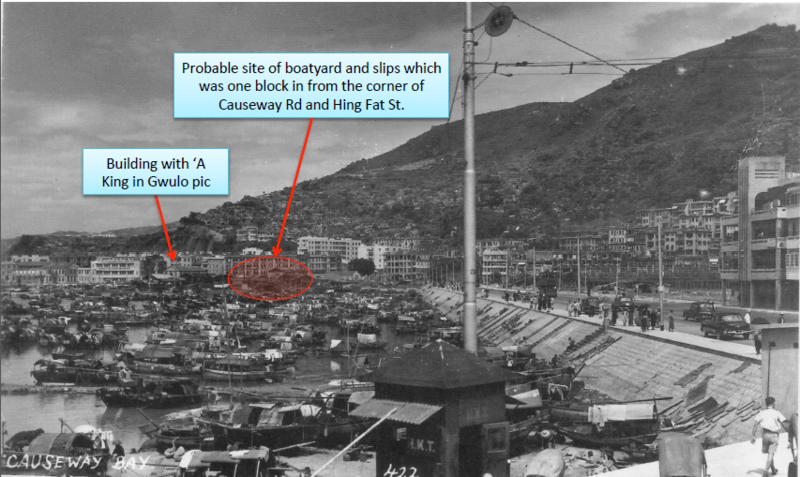 The image below, courtesy of gwulo.com may show part of Ah King’s shipyard in its second location and was taken shortly after the 1937 typhoon but, given the indications of the street index referred to below, this cannot have been the yard, which is either in the extreme right of the picture of is just off it. So the first lot on the left headed north along Electric Road, which begins “from junction of Causeway Road and King’s Road (i.e. BEFORE we come to the first basin noted below), is neither an Inland nor a Marine Lot but Crown Land and at this stage occupied by Ah King. Hence my doubts about the Gwulo location. 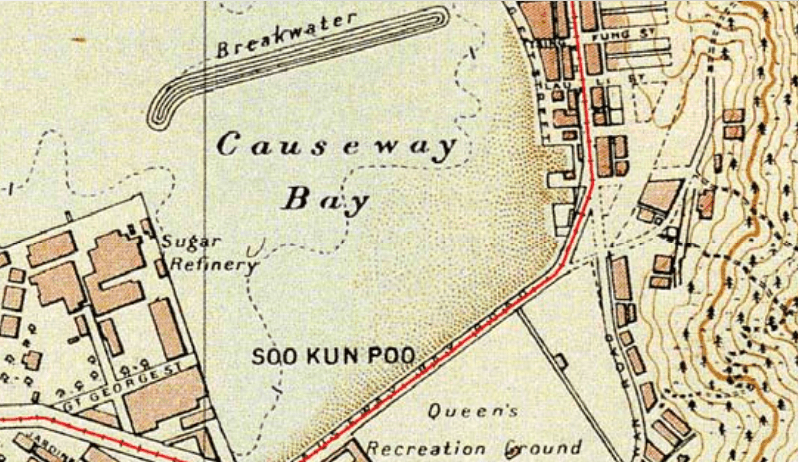 The small map in the BAAG piece at top shows A King’s slipway and yard tucked right in the corner of the 1937 period Causeway Bay typhoon shelter after the completion of Causeway Road but before the driving through of King’s Road had been mapped as completed. This conforms with the Street Index evidence.If you look at this detail of a 1937-45 (1937 survey with updates) map you can see it basically agrees with the BAAG map and shows what the Street Index indicates. What it seems to imply agrees with the doubts about the Gwulo photo analysis, once one sorts out where the main yard is. You can see there are two basins in the south east corner. The Ah King yard seems to have been in the smaller, furthest south basin with its place of business on the piece of Crown Land immediately south. The building with “A King” on the end wall is somewhere in the cluster of buildings north of the larger more northerly basin and may be the “A King” on the walls is unrelated or was an advertisement. It is possible that over the years up to the 1950s and its relocation, the yard expanded to include both basins. I found a 1950s photo that seems to show, if not exactly where A King’s yard was, because nothing is actually identifiable, then where from the other evidence we have reason to suppose it was. When this area the typhoon shelter was reclaimed to create Victoria Park in 1955, the yard moved to its final location just WNW of where the Tung Lo Wan Fire Station now stands. A. King Slipway. I have been living this district Causeway Bay since the 1940’s and have seen the development and relocation of A. King Slipway. Here is the exact location of A. Kings Slipway. 1940 The location according to the present address system would be at No. 30 Hing Fat Street, Kaifong Welfare Association Building.The Hing Fat Street Post Office is there today. The slipway fronted the old Causeway Bay Typhoon Shelter. A two level building was constructed there. The owner Ah King lived on the upper floor and the lower floor were workshops. 1941 During the Japanese war, a Japanese Bomber plane was shot down and lodged at the slipway. The bomber was removed after the war. 1950 The government planned to build Victoria Park and needed to reclaim the old Typhoon Shelter from No.1 to No.98 Hing Fat Street. The new Causeway Bay Typhoon Shelter was moved outwards to 98 Hing Fat Street, where Citibank Tower is today in 2015. 1950 The government offered a piece of land opposite No. 98 Hing Fat Street, where Tung Lo Wan Fire Stations is today and A. King Slipway moved to this new location and built a new slipway there. The Port Health Service Pier was located next to A. King Slipway. 1960 Shipyard business was slowing down and the slipway did not have much activity. 1973 A. King Slipway Company Limited was incorporated on 4th Sept 1973 under Incorporation No. 0035253. 1980 The Island Eastern Corridor was constructed and completed in 1986. The flyover beams or the corridor was partially blocking access to the slipway and the slipway on repaired small boats. 1986 The government conducted negotiations and acquired the land from A. King slipway and contracted the Tung Lo Wan Fire Station at the location.